Thank you a wowonder autor for idea and script this code is posible. 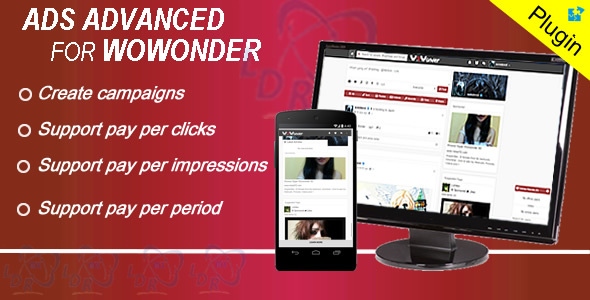 Using this plugin you can publish ads on your site, this plugin is compatible with wowonder 1.5.x Thank you for purchasing this plugin. If you have any questions that are beyond the scope of this help file, please feel free to email via my user page contact form here. Thanks so much! >All Version Supported and easy of update. NOTE: Before clicking, check it very well, because there is no refund after purchased.